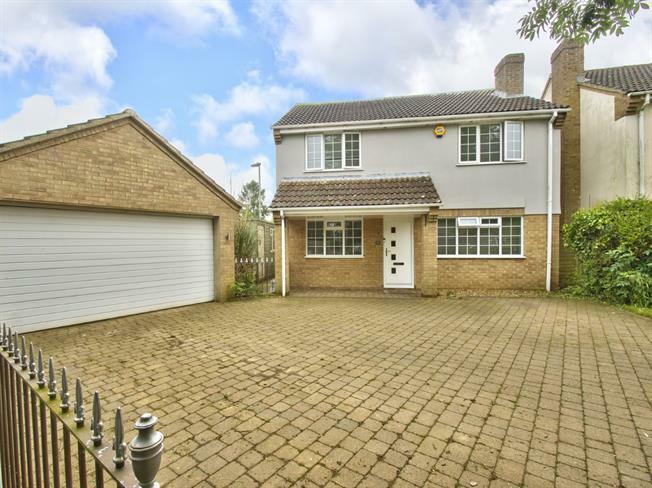 4 Bedroom Detached House For Sale in Huntingdon for Asking Price £450,000. A deceptively spacious four bedroom detached family home, located within the ever popular Grafham Village. Internal accommodation comprises; entrance hall, downstairs WC, lounge/dining room, study, conservatory and kitchen/breakfast room. The first floor provides four bedrooms and a four piece family bathroom with spa bath. Outside this property boasts an enclosed landscaped rear garden, whilst the front provides a double driveway leading to a double detached garage. Amtico flooring and feature skirting lighting, radiator, cloaks hanging space, turning staircase to first floor. Refitted with a range of quality lacquered units with granite counters incorporating breakfast bar, inset sink and drainer, integrated 'Bosch' appliances to include double oven and hob, dishwasher, washing machine and 'fridge, recessed ceiling down lighters, pelmet and kick-space lighting, cupboard housing combi-boiler. Window to rear and part-glazed door to garden. Radiator, multiple electric sockets, window to front. UPVC construction with brick plinth, Amtico flooring, glazed double doors to garden. Refitted cloakroom with washbasin and WC with concealed cistern. Tiled floor, window to side. Refitted with double-ended hydrotherapy bath, glazed double shower enclosure, washbasin and WC. Fully tiled walls, Amtico flooring, radiator/towel rail, ceiling down lighters and fitted speakers. Window to rear.